Having finally gotten rid of the last dirt under my nails (it just didn’t want to let go) and slowly starting to reacclimatise to the more chilly weather of Cornwall, it seems about time to reflect on the 2 amazing weeks in Kenya. Anyone who was there would probably agree that it was an amazing trip, which I think the #kenyafieldcourse on twitter also proves. Coming from chilly Cornwall (I’ll keep the word cold for Denmark), the dusty evening heat of Nairobi was a welcoming feeling. It was already dark when we landed and got all our bags into the waiting mini buses. I hardly had time to notice that the Policy course people where not around us anymore. We spent the night at a hotel before we start our two weeks of sleeping in tents. Then our journey begins, from Nairobi on to Naivasha, Crater Lake, Hell’s Gate, Nakuru, Naro Muro, Solio Ranch, Lewa Wildlife Conservancy, Ol Pejeta Conservancy, Meru, Mount Kenya, and Samburu. Crossing the equator more than once, if I am not mistaken. As we leave Nairobi on our way to Naivasha, the roads get more bumpy and dusty. Something that we will become very familiar with over the coming two weeks. It’s amazing how many of us could nap on the bus, with those bumpy roads. Heads lolling and sometimes getting smacked against the window or roof, though that did tend to wake people up. Arriving at Naivasha we set up tents, which were our new homes. It went surprisingly smooth, though I’m not sure what I had expected. As we put them up and took them down several times on our trip, we got pretty good at it. However, my tent group seemed to have a tent that got fatter over time. For some reason it got fatter every time we took it down and had to roll it up. Maybe it was just swollen tent poles from the heat? 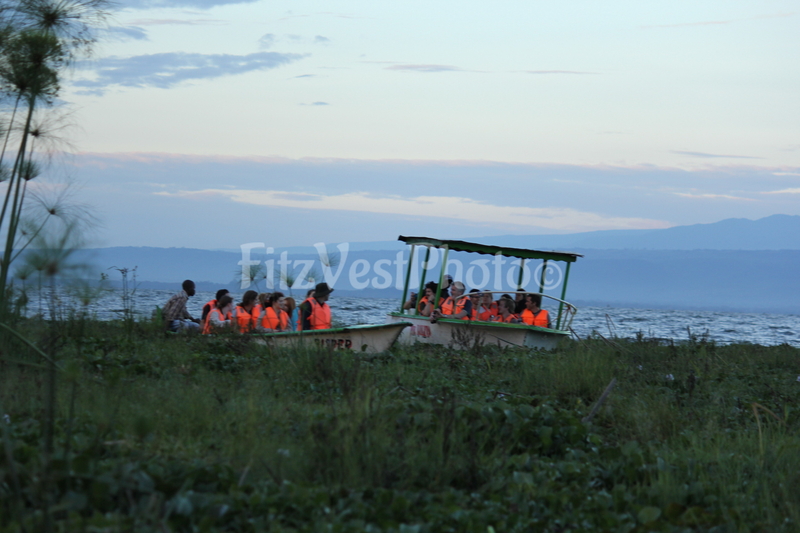 Being by Lake Naivasha, we of course had to have a boat trip out on it and do some bird watching. 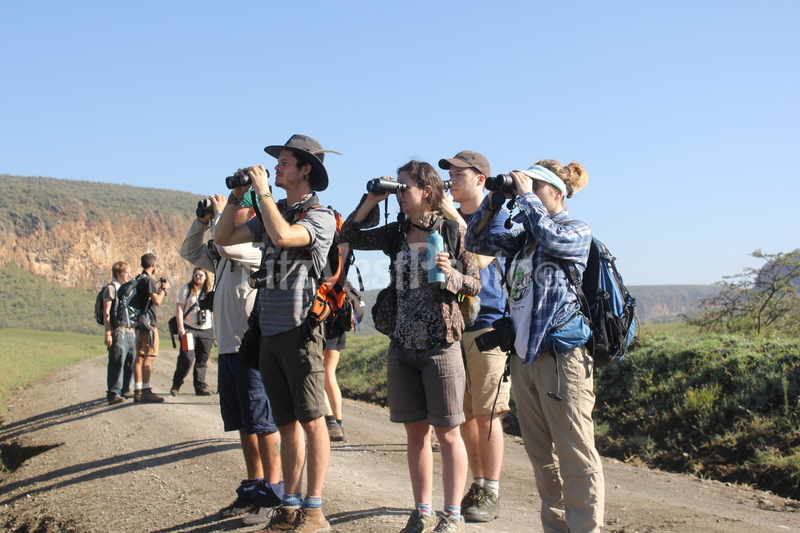 I’m pretty sure that our field course might have produced some new birders, myself included. Fighting our way through water hyacinth we made it out into the water, as the grey clouds came closer. Luckily we only experienced a drizzle, and we have generally been pretty lucky with the weather. Though the drizzle subsided, it got windy and surprisingly choppy on the lake. In the end people were hiding from the splashes of water, rather than looking at birds. We did also see a few hippos. Making our way back we had to fight the water hyacinth again, and this time my boat decided to do some team building, and helped by pulling at plants and trees to get us through. The following day we drove to Crater Lake where we had guided walks, and it made me feel privileged to walk among the wildlife, such as zebras and giraffes. After lunch we went to a chameleon farm, and after a short introduction were basically allowed to walk around freely and hold chameleons (if we could spot them). It was not all just fun and games. The next day, which was a Friday, we went to Hell’s Gate and did some distance sampling on ungulates. We ended our day at Hell’s Gate with a Gorge walk, where the film Tombraider has been shot. Saturday we packed camp, said goodbye to Naivasha and the other field course groups (policy and behavioural) and drove to Nakuru National Park. Here we had our first of many game drives, driving to our camp. From then on it was game drives every morning and afternoon, and no more walks with wildlife. This was also the only camp where there were fencing around us. Sunday we arrived at Naro Muro, Monday we visited Solio Ranch and its rhinos. Tuesday was dedicated to Mt Kenya, where the stars were still out when we got up for breakfast. This allowed us to start our walk from the gate at 7 o’clock. 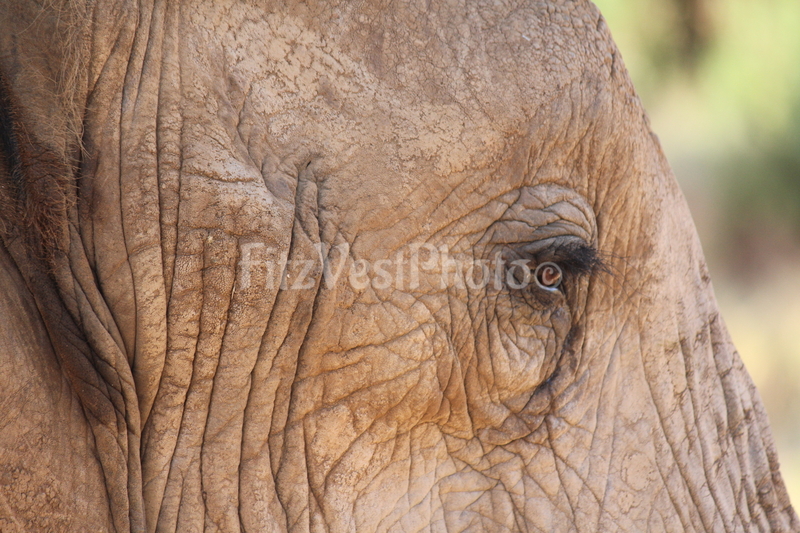 Wednesday we went by Lewa Conservancy and then Ol Pejeta, the latter we stayed overnight. 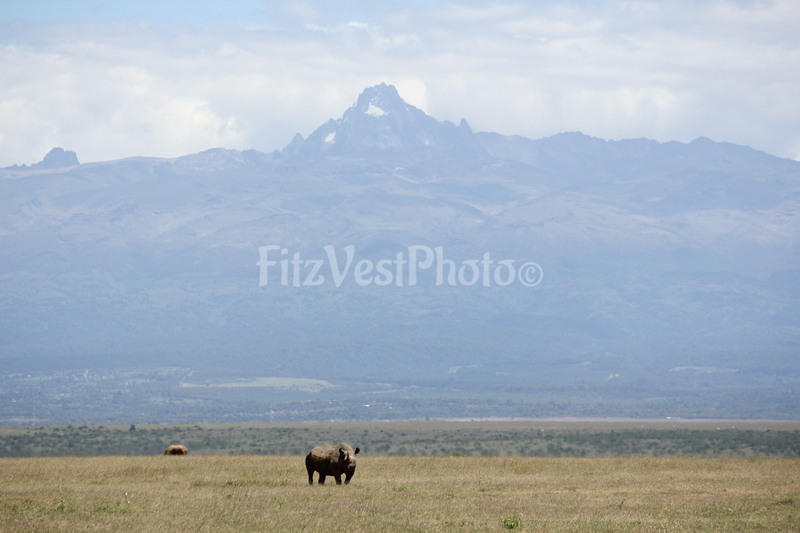 Thursday it was onwards from Ol Pejeta after the ritual morning game drive, and on to Meru NP. Though we were divided in tent groups, just like we were in bus groups, our tent group was increased by one Thursday night. As Jess and I were getting ready to sleep in our pod in the tent, we had a camel spider join us and scurry across our notebooks. It was almost on its way into my sleeping bag, though I managed to catch it before then. We saw rather few spiders and snakes on our trip, considering that we slept in the wild. Saturday we were on our way to Samburu, which were our last place before going back. Having spent our trip in tents, often with long drops and limited showers, we were pretty good at the whole camping thing. Even at my cleanest, I was still dirty. Washing off one layer of sweat, dust and sun crème, only to have a new layer replace it. Doing game drives is a rather dusty business, but I’m sure that the layer of dust only acted as extra protection against the sun. On our way to Samburu NP my bus got a fit of baby wipe cleaning. Wiping away the dirt from our faces was one thing, but we ended up cleaning our binos and cameras too. They looked so nice and clean after that, so when we did our game drive through Samburu NP, to our last camp, it didn’t take long for them to get dirty again. Arriving at Samburu we got a surprise, which included a nice cold drink at arrival and a chance to cool down. The following day we did some distance sampling, and coming back to “camp” made a poster and presentation. You don’t need powerpoint and other fancy stuff to make a scientific poster, as we did just fine with a piece of paper and some markers. On that same trip our bus had a great, if a little intimidating, experience. Our driver had gone out for a pee, and we were watching some birds. I think it may have been rollers, when we see an elephant come out onto the road behind us. Of course this elephant wasn’t alone, but had the family along. By the time our driver had hurried back into the bus, we didn’t dare start the engine in case we spooked them. So we stayed put as quietly as we could in our excitement, as the elephants walked right by our bus only a couple of meters from us. The last elephant to pass was of course the biggest, and we assume the matriarch, and she stopped and paused for a second beside us. It was an amazing and intense experience, that it probably one of my best from the trip. The elephant matriarch, we think. Monday was our last day, and of course we had our morning game drive and then breakfast and off we went. We didn’t make it further than out the gate of the NP, before we had our stop. We stopped at the village of the Samburu people, where we were told about their customs, shown into their homes, included in their dance and warrior jumping, and shown their crafts. Then we got in and the journey to Nairobi Airport began. For most busses that probably just included a long bus journey, with a lunch stop. Our bus on the other hand got a bit of extra excitement. You could say we left Kenya with a bang. We were driving 80k/h making our last stretch of the journey. Only an hour to go, when we hard almost like a bang, and it felt like the tire underneath my seat was ripped off. We had a blowout. Great respect to our driver, who made sure that the bus kept going straight, decreased the speed and got us to the side of the road. It turned out the tire was still there, though it looked very shredded. We got the tire changed, and were on the road soon again, and got to the airport. The policy group were at the airport too, and though everyone was swapping stories, everyone was also working on their species list. My bus group at Hell’s Gate, doing some distance sampling. So what did we get out of this field course? (1) We got talks from several people in Kenya working with wildlife. This included both talks from people working in the reserves/parks we visited, but also those who came to our camp to give talks, as well as the talk we had at the KWS. One thing that seemed to be the trend of many of these talks was the problem of poaching, and also wildlife conflict. The talk of the new Wildlife Act was also a topic of interest. (2) Seeing different reserves under different managements, both private and public, and fully fenced and semi fenced. (3) Do some distance sampling and discussing the pros and cons of such uses. (4) Collect data for us to use in our Statistical module, back here in Falmouth. (5) Get good at ID-ing, as we compiled our species lists. (6) Because of the bus and tent groups made, and how much time we spent in the groups, we got to know people better or just know them at all. It was interesting to see how the dynamics between people changed during the course, and just as interesting to see what will happen now that we are back. I may very well have forgotten a good many things to write here, but then it would also be too long. All I can say is thank you to everyone for a great trip. A special thanks to my bus group, who I have spent a lot of time crammed in our little bus with and enjoyed spending time with.